I feel obligated to let you in on New Times' best kept secret, as I'm not sure all of you are privy to the inner circle of lies we are propagating. But Daniel Joshua Phares, who's currently fighting charges of making a criminal threat to three women associated with the Women's March SLO, has obviously been listening to our whispering sphere of liberal propaganda. "A leftist cesspool spraying corruption in a wide arc. Panders to arrogant liars, child abusers, drug addicts and useless non-contributing animal torturers. One can only imagine the trail of dead bicyclists and neglected homeless that have been murdered by its slanderous lies." We'll totally claim the leftist cesspool and arrogant liars, but the child abusers and the non-contributing animal torturers! Whatever gave you that idea? Really, though, I'm flattered he took time out of his busy schedule of trolling to let us know he was on to our game. Our Cheshire Cat-like jig is up! But really, Phares sounds like a real stable, swell guy. This from the same upstanding citizen who the SLO Police Department said left a "specific death threat" on the event page for an Women's March SLO-organized anti-racism rally called Outshine the Darkness that was held in SLO after the violence between white supremacists and counter-protesters in Charlottesville, Virginia, that left one woman dead. Phares pleaded not guilty to the criminal threat charge on Nov. 9. The police wouldn't release the specific comment he left, but Cal Poly student organizer McKinley Bruckner told New Times: "He said, 'I'm going to kill you and make you like it." A quick glance through Phares' Facebook feed will also show you that this guy regularly makes thinly veiled threats of violence against liberals, African-American activists and celebrities, ugly people, and pretty much anyone and anything he disagrees with. Thank you social media, for giving trolls a much-needed voice. It's really done wonders for our democracy. For instance, it's given my favorite member of the arrogant leftist cesspool that New Times panders to, 3rd District SLO County Supervisor Adam Hill, an opportunity to really let his feelings loose. I mean, he can truly let those bottled up feelings spray out in a wide arc of emotion. We're not trying to get kicked out of the liberal cabal or anything, but Hill is kind of like Phares: He doesn't hold back if he disagrees with you or what you're trying to do—and sometimes those comments are what one could call, ahem, less than professional. If you ask CalCoastNews or CalCoastTimes or CalCoastTryingToForgetLosingALibelCase or whatever they're calling themselves these days, Hill and New Times were thick as thieves until recently. But really we've had a healthy love-hate relationship for years with our buddy Mr. Hill. Yes, our notoriously thin-skinned friend has called this paper and its reporters many things via text message, email, and Twitter. Remember that time he threatened to use the county drone on us? Those were good times, man. But we thought we were the special ones. We thought we had that kind of a bond. I mean we knew that Hill and CalCoast had a thing, because those "reporters" have nothing better to do than basically write gossip columns about Hill and his wife Dee Torres. And that's got to be tough, because we know from the recent libel case that sourcing and absolute truthiness are not CalCoast strong suits. However! That whole pile of stories they've written about you, a public official, doesn't really give you an excuse to basically tell frequent CalCoast contributor Keith Gurnee (who's vocally critical of you) that he should "look for love in the right places," because you don't return his gay affections. Aren't you a part of the same leftist cesspool as us? We don't insult people by calling them gay—it's one of those unspoken rules we spray out into the atmosphere. "I tried to let you down easy, but you crave something that I won't and can't give you," Hill wrote in an email response to an email Gurnee sent to all of the county supervisors. I mean, maybe Gurnee really is as Hill called him, a "little minx," but you'd probably have to verify that with his wife of almost five decades. Hill, of course, told New Times "this guy [is] a joke." Oh, are you doing a bit? I get it, and it makes me grit my teeth and cringe. You've been in office for more than eight years! Maybe just try not responding. Because you're literally only feeding into the fire that your opponents are building against you. And it's not helping our cesspool's cause! Actually, Hill did express some regret for his reaction. Something I'm not sure I can say for a certain Cayucos School District board member (cough, cough, Ron Wilson), who basically threatened one of our reporters over the phone with a "you better not make me look bad again or else." 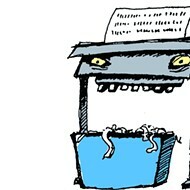 The Shredder is doing the leftist backstroke at shredder@newtimesslo.com.